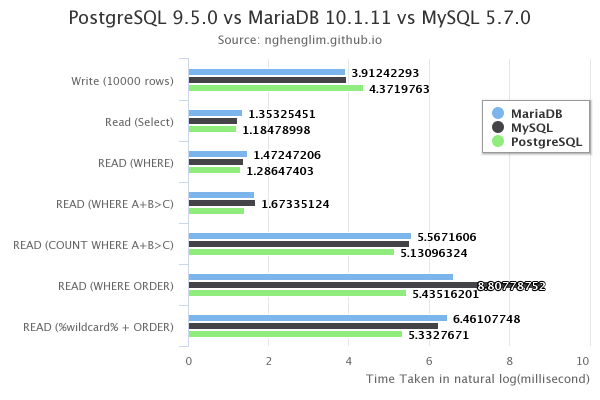 On Dec 2015 I have done a similar benchmark on postgres vs mariadb vs mysql, however I had done some serious mistake on the benchmark and caused the result to be biased towards MySQL. Therefore I had enhanced the benchmark. The benchmark script and how to setup is at this Github Repo. This benchmark is using default configuration that comes with the docker image. Default configuration should give a basic idea on how the database performs. Is in the To Do list, however IMHO these are good to have benchmark. Preferably others can help to enhance the script. Do not want to spend money to buy a physical server or cloud instances. Make benchmark decentralized, everyone who had a laptop should be able to do their own benchmark instead of relying on others. A rough idea on how these databases perform is very important knowledge for all the developer. 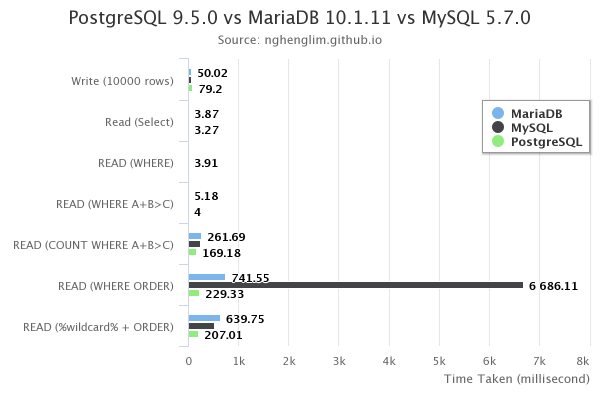 As a result, I think that choosing PostgreSQL is a better options for RDBMS - provided that PostgreSQL comes with more features and following standard SQL.